Jesse Hicks is far from your average college kid. The 21-year old, hard working, fast learning SUNY New Paltz student is mature beyond his years. Unlike your typical early 20-something, Jesse isn’t interested in the night’s special at the local bar or how many followers are his instagram feed – he doesn’t sleep his weekends and stays away from junk food. A quick peek inside Jesse’s life reveals an active, business-minded 3rd year college student with a notable collection of awards and accolades to his name that are like those of a blue-chip collegiate athlete. However upon further inspection these plaques and trophies don’t read ‘Most Free Throws Made’ or ‘Division Championship’ but instead Jesse’s collection of decorated honors are inscribed from college chancellors, local business associations and even one from the President. Now that’s power. When he’s not active as the Campaign Director for the Nevele Resport Casino & Spa, you can probably find Jesse donning a life jacket, knee deep in the water of Upstate New York busy maintaining his own business, A Day Away Kayak Rentals. We recently had a chance to catch up with Jesse to talk his love for kayaking, his strong business acumen and which one makes him sweat more. So, you grew up around water and boats, what was it about kayaking that interested you? It all started as a kid. My family owns a small marina called Lou’s Boat Basin in Kingston, NY. I was always on the water and grew up around powerboats, jet-skis and jet boats. In school, I was an athlete. I played soccer and lacrosse throughout my middle and high school careers but never really engaged with water sports. People with boats would always make fun of kayakers. Kayaking back then was not what it is today, that is for sure. No one thought the sport would be where it is today, but I knew. It looked cool and I always wanted to try it, so one day after a couple of weeks of working construction with my father, I saved enough money to purchase two kayaks; one for me and one for a friend to give it a try. I wouldn’t want to do it alone. So one day after a paddle, we set the kayaks against the wall by the road on Rt. 213 in Kingston to clean the boats. And as we were cleaning, a couple from New Jersey visiting some friends in the area stopped by and offered me $100 to “borrow” my boats for an hour. I was 14. What 14 year old is going to say no to that? I had no concept of liability at the time! For our readers that don’t know, tell them about the different kinds of kayaking there is to do. Kayaking is neat in the way that anyone can get in a kayak and be on their way within minutes! 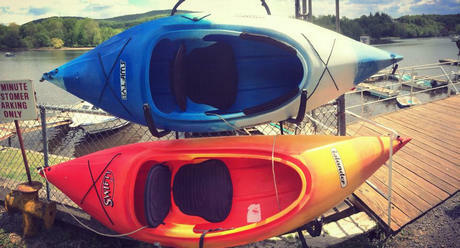 There are three major different types of kayaks that are offered specifically in our area. There are whitewater kayaks, recreational kayaks and touring kayaks. White water kayaking offers a more aggressive kayak paddle, where tour kayaking offers a great long distance trip. The boats we offer are focussed on the general recreation paddle. Anyone from beginner to novice can paddle. Guiness Book of World Records shows that the kayak waterfall record is a drop of 180 feet! Have you ever done any extreme kayaking? What kind of extreme kayaking would you do? My goal right now is to build my business to a point where I can take a year off to travel and try whitewater kayaking all over the world! I constantly watch youtube videos in my down time of people jumping out of planes and going down ridiculous waterfalls. It looks crazy, so for now I just nod my head and say “one day”. At sixteen years old you started out with two kayaks and now you own your own kayak company. As a business owner, what makes you sweat? When I first started my business, I would constantly sweat over getting people in the door. It was tough to get to where I am today with my current clientele. I started the company with two kayaks and a $100 scholarship for marketing. I initially took the two kayaks, tried to find any couple or group of two to go kayaking so I could re-invest the revenue into buying more boats. The calls were coming in, but there were just too many for more kayaks than I had at the time. It was too much for me to handle. That made me sweat more than anything; trying to get enough boats in time to stay alive in the market. The next obstacle was obtaining a credit card reader. All of my guests use credit to pay for the rentals. Try asking credit card operators you need a credit card reader at 14 years old. Then try telling your customers you are only able to take cash. It turned so many people away! Huge bummer! Now, the only time I sweat is during a long day of paddling after closing the shop. It is a good feeling! 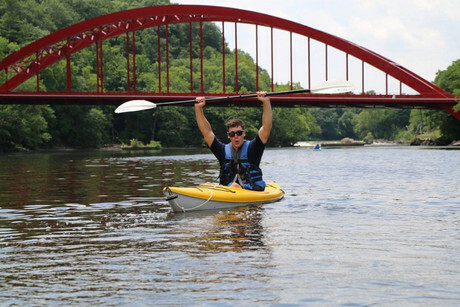 Kayaking is a pretty strenuous activity, and requires a ton of upper body strength. How do you stay fit to kayak? During the summer, I go to the gym once a day and try to go out for a paddle at least one night during the week. Stand up paddleboarding to be specific. It is like walking on water! Great for a core workout. Each day preparing, cleaning, and putting away the kayaks keep me fit too. When I am in school, I play on the Hawks club lacrosse team at SUNY New Paltz, participate in intramurals, and go to the gym when I have time between classes. What’s on the horizon for you? Any cats you can let out of the bag? You are going to need a lot of catnip to get this cat out of a bag! Lets just say we are just getting started. See us online at takeadayaway.net and follow us on Facebook and Twitter. The greatest distance by canoe/kayak in 24 hours on flowing water 279.02 mi by Carter Johnson (USA) down the Yukon River starting in Whitehorse, Yukon Territory, Canada in June 2011.